I braved a new recipe last night, and it was so easy and versatile, I thought I would share. 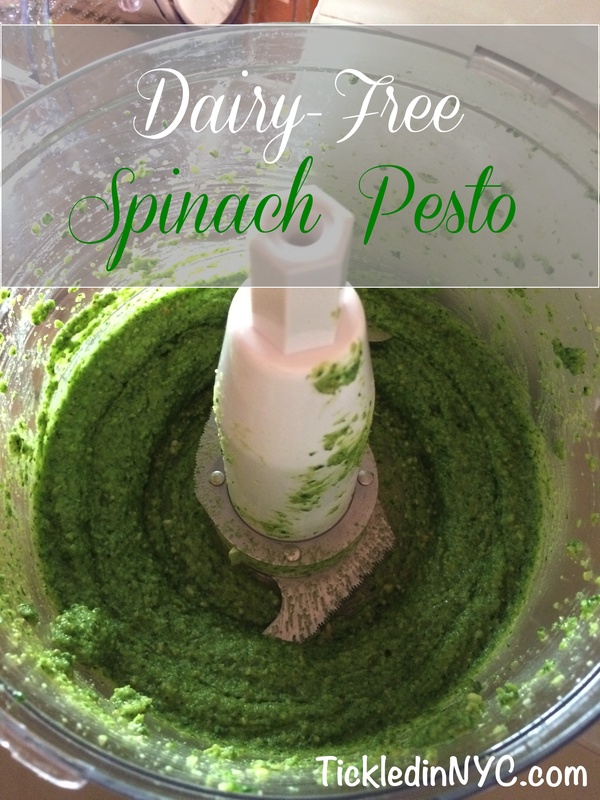 I’m allergic to dairy, so pesto sauce has never been something that was very accessible to me (the best stuff always has Parmesan cheese in it). I’d seen a wide variety of vegan pesto recipes on Pinterest and I finally decided to go for it. 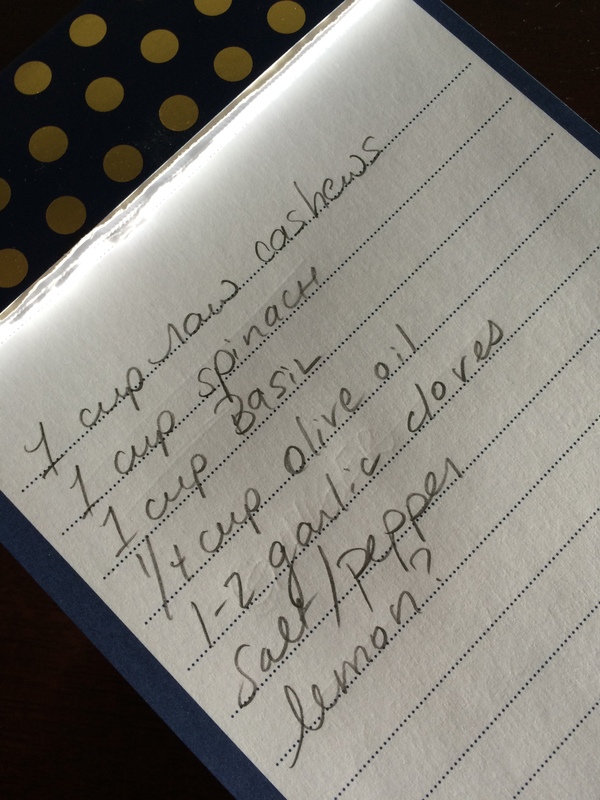 I shopped with a recipe in mind that was half spinach and half basil, but when I got home that specific recipe looked a little too “healthy” to suit my (and most likely my husband’s) tastes. 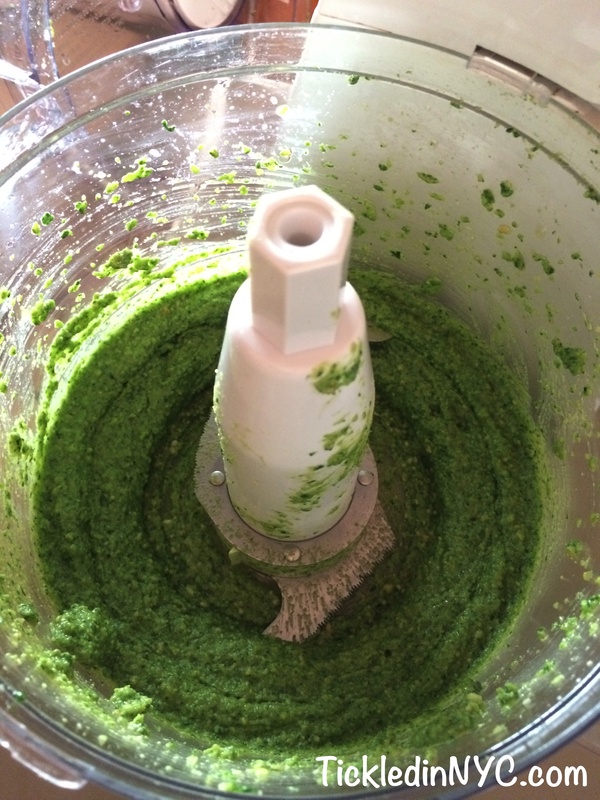 Unfortunately, I still had a somewhat small amount of basil to make a large batch of pesto, so I decided to include the spinach to beef up my results. 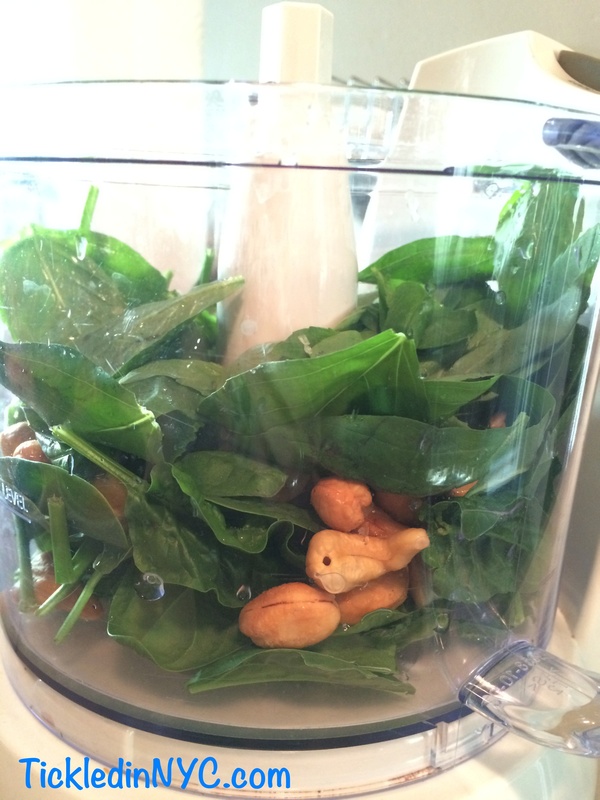 After washing my ingredients and removing the basil stems, I loaded the spinach, cashews, basil, and the juice of 1/2 the lemon into the food processor. (I probably should have added everything that my recipe called for…but since I only took pictures of these ingredients they got thrown in first – rookie mistake). I purposely waited on the salt and pepper, to see how the spinach/basil combo worked before adding spices that I couldn’t remove. Then I let the food processor do its job. Clearly, I was in need of some additional liquid elements – and my recipe smelled really sweet. I needed to savory this thing up! That’s when I realized that I totally forgot to add the garlic and the olive oil- whoops. I peeled 2 large cloves, but only added a clove and a half since they were so large. I wanted to be sure I could still taste some basil at the end of this adventure. I added the olive oil in small amounts, making sure that I found the right consistency, and tossed in some salt and pepper as well. Finally things were looking good! I tasted my creation and decided it still needed a hint of cheesiness so I sprinkled a couple pinches of nutritional yeast on top and sent the food processor for another spin. Nutritional yeast usually gives me the icky fake nacho cheese vibe, but with the sweetness of the basil and the garlic and olive oil, it was just the right hint of cheese. 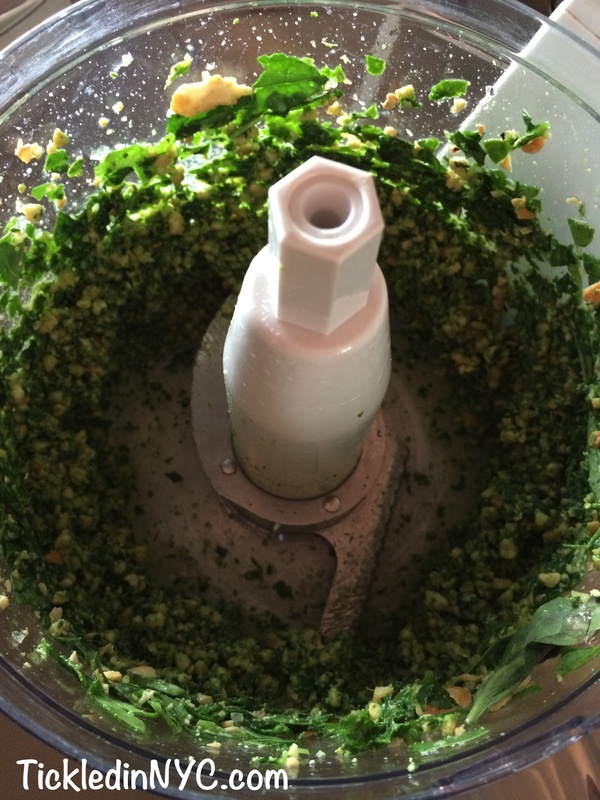 Place all the ingredients in a food processor to combine. Store in the refrigerator for up to 3 days, or freeze and use later. 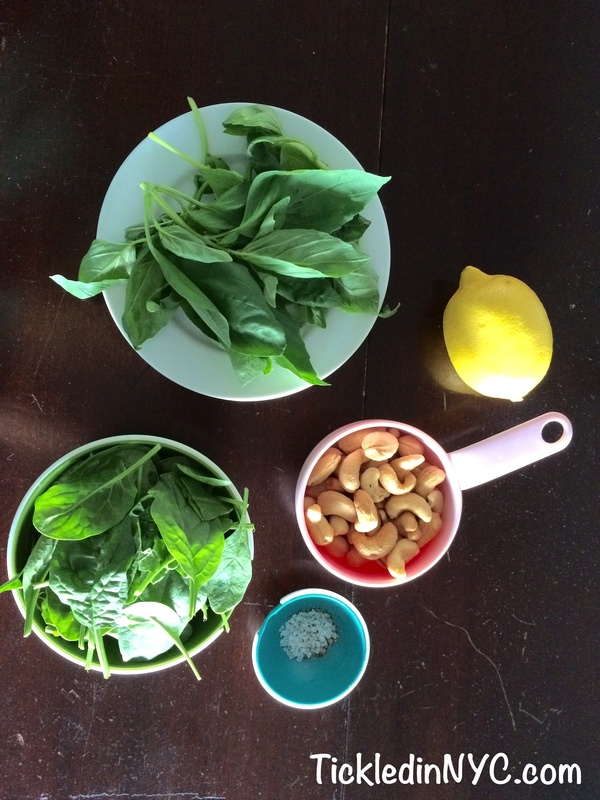 I have big plans for this pesto. We can have it on pasta, use it as pizza sauce, or as a spread on sandwiches! Best of all, it only took a couple minutes to make!